North Carolina Attorney General and gubernatorial candidate Roy Cooper held a press conference at Central Piedmont Community College this morning to announce his jobs plan if he's elected governor. Rolling out his plan with the slogan "A North Carolina that works for everyone," Cooper called for a full repeal of HB2, recalling how many jobs the bill has already lost Charlotte and the state as a whole. With the state's largest community college as his backdrop, Cooper called for more collaboration between high schools, community colleges and the government. Progress North Carolina has sent Gov. 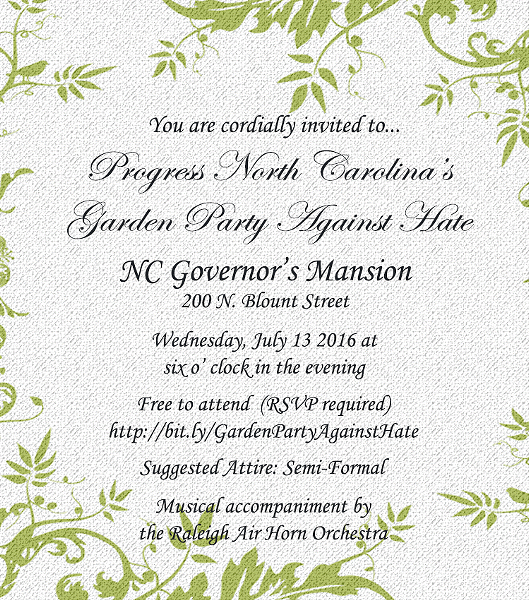 Pat McCrory an invitation attend the exclusive "Garden Party Against Hate," to be held in his own home. The nonprofit rented out the Governor's Mansion in Raleigh and will be hosting other pro-equality groups there tonight at 6. “We’re grateful to Gov. McCrory for letting us hold our Garden Party Against Hate at his house, and we’d like to return the favor by personally inviting him to attend,” Gerrick Brenner, executive director of Progress NC, wrote in a press release. “Much of North Carolina’s LGBT community feels that Gov. McCrory has completely ignored their concerns, so this would be an excellent opportunity for the governor to have an honest conversation about how HB2 puts LGBT North Carolinians at risk, and is bad for the entire state.” The garden party will also serve as a viewing party for the famous "Air Horn Orchestra," which has used air horns and noisemakers to protest House Bill 2 outside of the mansion every Wednesday since it was passed — save for the Wednesday following the Orlando shootings at an LGBT nightclub, during which members held a memorial. Progress NC will be live-streaming the dinner party on Facebook Live. Police are investigating the murder of 41-year-old Donnell Drakeford in west Charlotte overnight. Police responded to an assault call on Ridgevalley Drive just before midnight and found Drakeford suffering from an apparent gunshot wound. He was pronounced deceased by Medic. Detectives are still investigating the case.